Common Assignment & Research Questions: Do you have (_____) DVD? Visit our feature film collection located across from the Reference desk on the third floor of the library. Missouri Southern students, faculty and staff may borrow up to five videos at a time for a period of seven days. They may be renewed for one additional time period if no one has requested the item. -continuously added award winning & nominated films! All non-fiction DVDs are filed by Library of Congress Classification call numbers on the second floor of the library with our main collection books. 1. 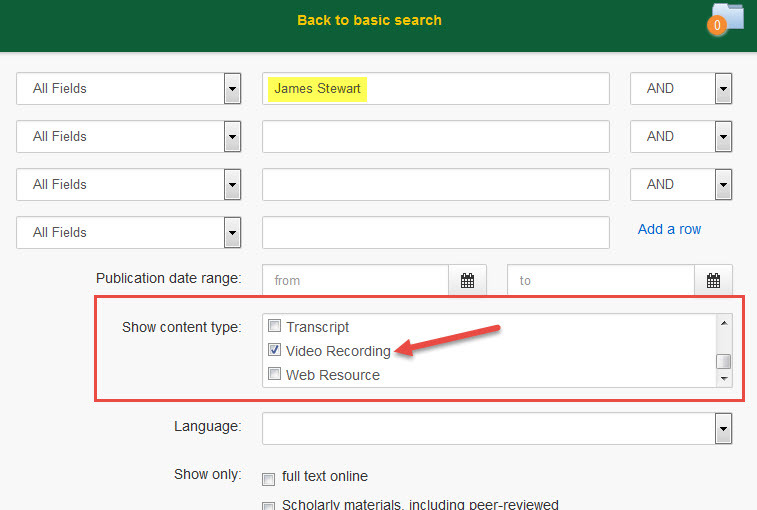 Click on the 'Advanced Search' link in the Summon @ MSSU search box located on the library homepage. 2. If you are looking for a particular movie or a certain actor/director, you will enter that information in the available search fields. You may also search for DVDs by topic. In the example below, we are looking for any movies with James Stewart. 3. After entering your keywords in the search fields at the top of the Advanced Search screen, select 'Video Recording' in the 'Show content type' box. This will limit your search results to recordings (DVDs, VHS, Cassettes, etc.) and should remove all other content types - books, ebooks, newspapers, etc. 5. 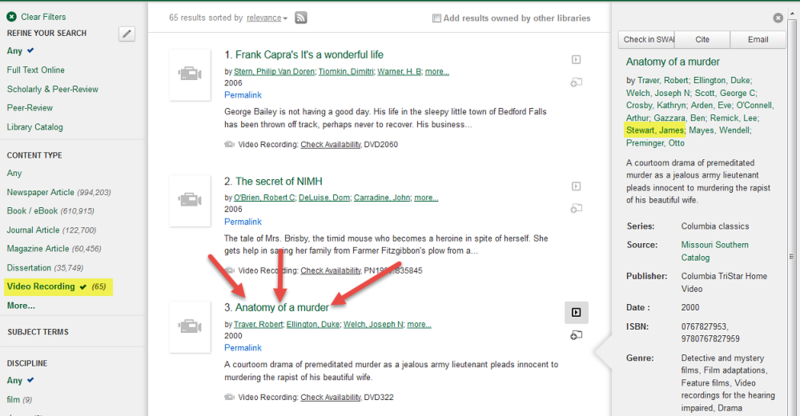 Clicking on the title opens the catalog entry page; indicating the DVD (video recording) is AVAILABLE and located in the MSSU DVD collection at the time of this search. << Previous: How do I find MSSU Honors Theses?